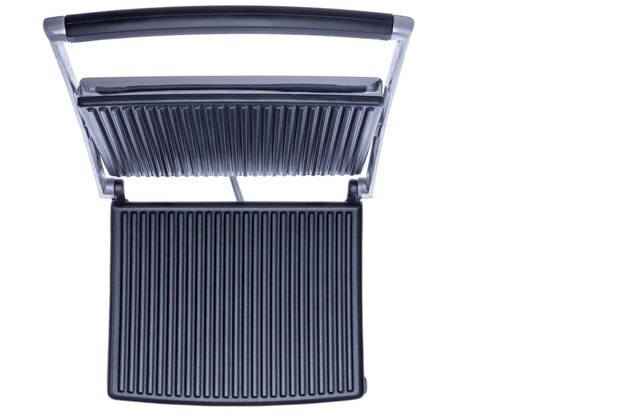 Panini makers can be used for more than just making sandwiches; they are also contact grills that can be used to cook a variety of meats, including fish. If you have a hankering for grilled fish and the weather isn't suitable for outside grilling, you can grill your fish indoors using that panini maker. Even thin fillets of tilapia can be grilled in this way. Aside from the convenience of cooking indoors, panini makers are easy to clean, which makes your grilled fish an appropriate meal even for a busy weeknight. Plug in the panini maker. If it has adjustable settings, set the panini maker to cook on high heat. Oil the grill plates by brushing them with olive oil. If your fish fillets are tender or if the fish is drier, such as whitefish or tilapia, the fish will shred on the grill plates if you don't oil them. Rub the fish fillets with the seasoning of your choice. Dry seasonings form a pleasant, crispy coating on a panini maker. Choose a seasoning that matches well with the fish that you are grilling. For example, a savory lemon pepper seasoning goes well with whitefish or lighter fish, or choose a spicy Cajun seasoning for catfish. Place as many fillets in the panini maker as you can without overcrowding, and gently close the lid. The cooking time depends on the size and thickness of the fillet, as well as the type of fish that you are grilling. Thin fillets may cook as quickly as one minute, whereas thicker and oilier fillets, such as tuna or salmon, may require three to four minutes to cook. The fish is ready when it is opaque all the way through. Remove the fillets from the panini maker, and place them on a plate. Cover the fillets with aluminum foil to keep them warm while you grill the rest of the fillets. If you have a strong-smelling fish, open a window to ventilate the room. Clean the panini maker while it is still warm. Use damp paper towels, and clean the grill plates thoroughly. If any fish particles are left on the grill plates, the panini maker may begin to smell. Can I Cook on Aluminum Foil in the Broiler?